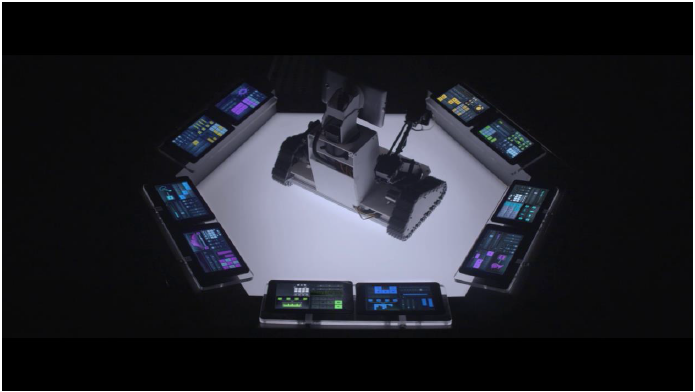 Intel, which has the long history of making the powerful processors have come up with a blistering campaign, where they showcase their powerful processors capacity using music. Confused ? Intel and Music ?? Yes, You’re right. Intel collaborated with a sydney based musician Harley Stertan, 'Flume' to debut the new tune using the Intel processors. Intel tablets have been used in it and a completely automated music tune is generated using the powerful intel’s processors and tablets. The complete idea is about giving a live music performance just using the tablets, and the music instruments. Doesn’t it sound awesome? It is indeed awesome. The computer tablets have been hooked up using soft wares in such a way that they automatically play the instruments to generate the music tune. Let me tell you that it is freaking awesome way to show the capacity of Intel processors. It took a twelve week of production with 2000 developer hours for this project, to make this short film. The Intel's Asia pacific region Director for Brand Strategy and integrated marketing, Jayant Murty, said that the shortfilm is designed to be an entertaining light and sound experience and also to encourage viewers to consider the technology which is at the heart of their tablets. Intel has also officially released the making of the video, where the developers say, it took 60 tablets along with custom softwares to come up with this freaking awesome ‘Intelligent Sounds’. Flume worked in collaboration with The Monkeys to produce the track. Gelardi said: “We had a concept and we needed a piece of music but we really couldn’t develop what the finished film would look like until we had the music. How to Hide Last Seen in Whatsapp on Android Phones ! Whatsapp is a cross platform application which runs on Android, Windows, IOS, Blackberry and all small scale Nokia OS. It provides facility to send the Photos, Videos, Audio, Location, Contact in just a flash which made it very popular among the users. Whatsapp comes with a timestamp called 'Last seen' which lets know when the user was last seen on his whatsapp. This last seen geneerally creates a lot of conflicts, especially between couples. Many people keep asking me, how to Make the Last seen invisible or how to hide it, so here's a simple way to do it. The Last seen technically cannot be hidden, but we can stop its update and still keep on using whatsapp freely. Technically, The Last seen is updated only when you open the whatsapp with the Internet connected. With Internet connected, the whatsapp automatically syncs all the messages recieved, and sends all the messages pending. Turn off the internet, and open whatsapp and read the messages receieved and send the replies you want to send. Note : "Last Seen" is updated only when Internet is connected and you open the whatsapp application. The same manual process can be automated using a simple android application which you can download. Open the app, enable "Block Last Seen"
Now, When you open the whatsapp, the Internet is disabled automatically which prevents the update of Last seen on whatsapp. You can read the received messages freely and reply to them freely. When you close whatsapp, the Internet is enabled automatically and all the pending messages are sent and synced. I'm sure, So many fights happening between Couples can be prevented with using the simple application.